Neil Gaiman does it again. Many times while reading this book, I wondered, where does he get his imagination?? All characters just seemed to come together for this one... And when I say all, I mean ALL. There’s the girl who has the gift to open any doors, the marquis de carabas who you’re never quite sure is good or bad, the majestic thousand-year old angel, the woman hunter whose goal in life is to defeat the fiercest beast in town, and the rat speakers who well, interpret rat speak to people… and amidst these interesting and out-of-this-world characters is your-average Londoner named Richard Mayhem who was unknowingly thrown into an adventure to save another world. “The audience stared, entranced and amazed. The only noise to be heard was the gentle, gasping almost-groan of wonderment that people make when they watch fireworks: the sound of awe. Then a grubby young man and a dirty-faced girl in a huge leather jacket walked into the light show and vanished. The door closes, behind them. The light show was over. 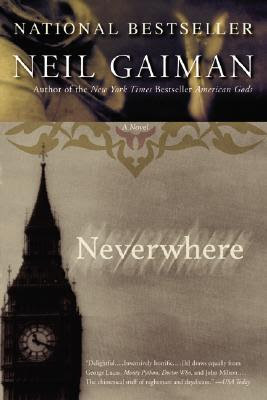 True to Gaiman fashion, Neverwhere is a masterpiece of wit, humor and profound thoughts from the otherworldly, yet, so relevant to the everyday life. Sometimes we get so used to seeing the same thing that everything loses its magic, its spark. Looking at the new world from the eyes of a sleepy London-er, everything was once again new and awe-worthy. This experience ended up drawing the adventurous side of him – a side he never knew existed. Well, I’ll just let you read it yourself before I spoil anything else! To Mr. Neil Gaiman, if you ever are in Manila anytime soon, I hope to meet and talk to you! Just want to know what is inside that brilliant head of yours. Yours truly, Joy “fan girl” Buena LOL.